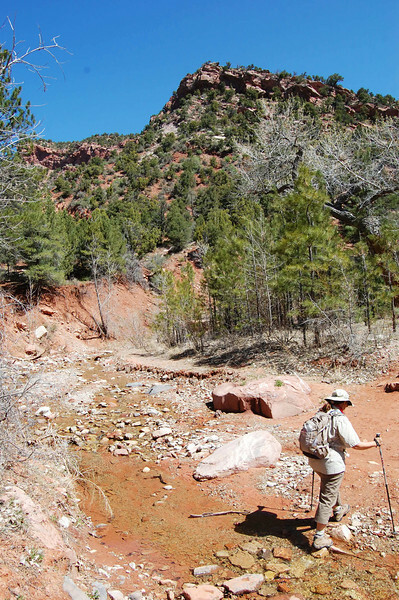 Today was a hike in the quieter, less-visited part of Zion National Park known as Kolob Canyons. Looking back on the photos, I don't think I gave this hike enough credit. 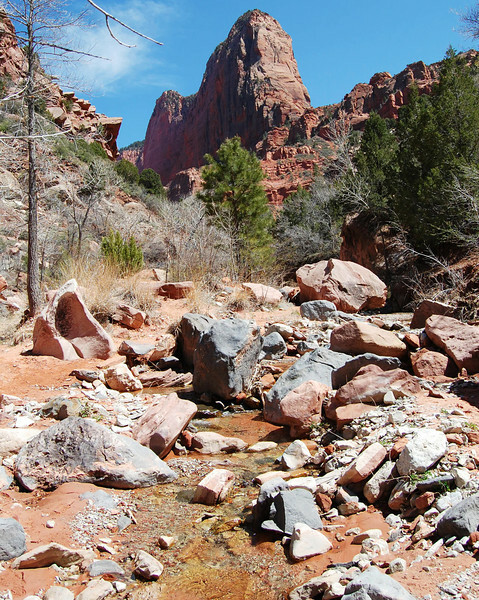 It's a really pretty hike along a stream with great red rock views. 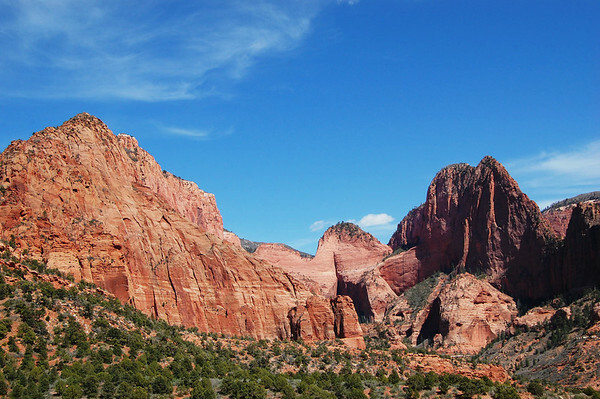 Today, we decided to do a five-mile round-trip hike in the less crowded section of Zion National Park: Kolob Canyons. 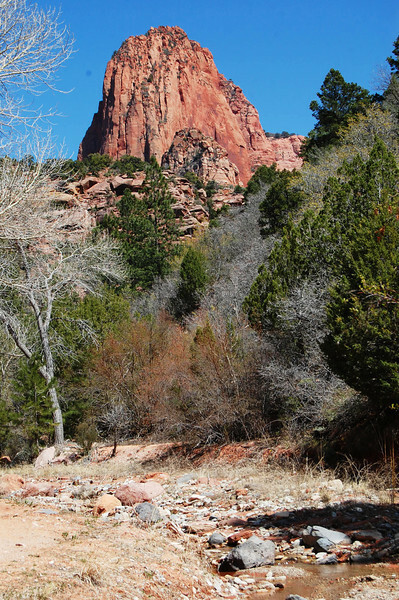 Kolob Canyons is located in the northwest part of the park with entry just off of I-15 south of Cedar City. It was a little less than 30 miles from our RV park. 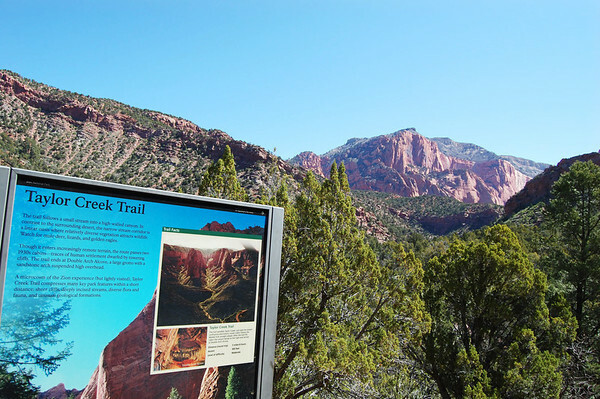 Two miles in on the Kolob Canyons Scenic Drive, we parked at the trailhead. 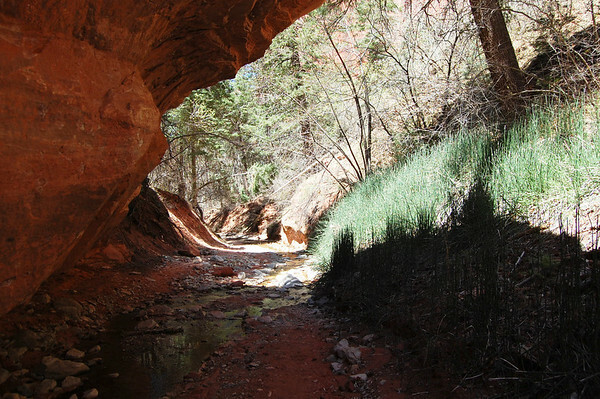 We're still easing into our hiking and decided to do the fairly easy Taylor Creek Trail (aka Double Arch Alcove Trail). 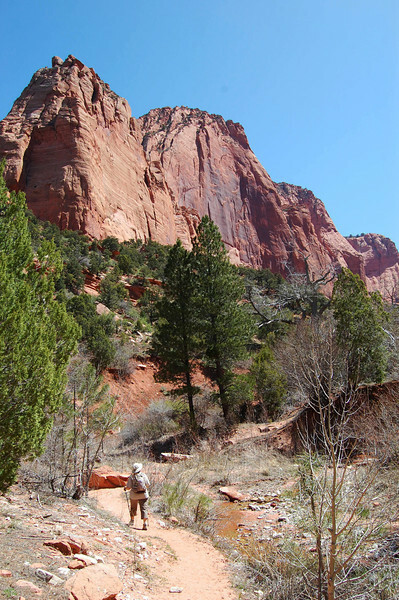 Because it's not difficult and it's relatively short, it's probably the most popular hike in the Kolob Canyons section. 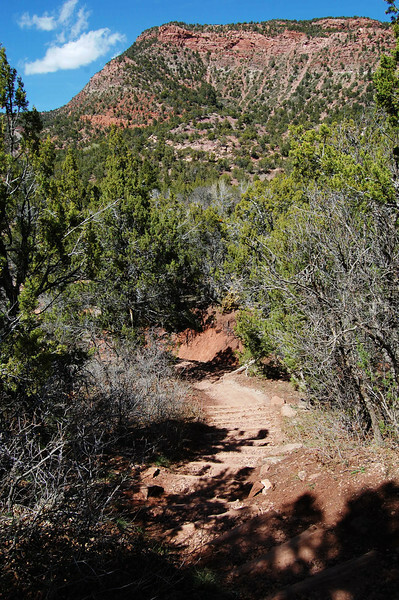 The trail starts with a lot of steps down from the parking area to the Middle Fork of Taylor Creek. We weren't looking forward to those steps at the end of our hike. Taylor Creek was very shallow today, but the water was flowing and we love hiking along with the sound of a babbling brook. There were numerous easy creek crossings. I brought our water shoes, but they weren't necessary at all. I'm tellin' ya, I lost track of all the creek crossings and sometimes we hiked in the creek bed, but it was easy to keep our feet dry. 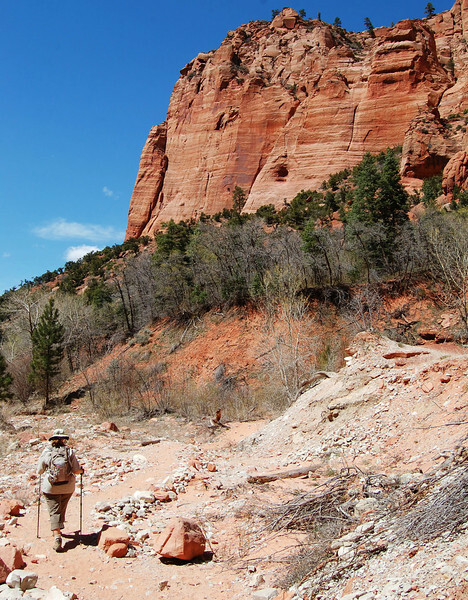 This hike had a lot of variety and some wonderful scenery. I, of course, loved this section of sage - my favorite natural aroma. 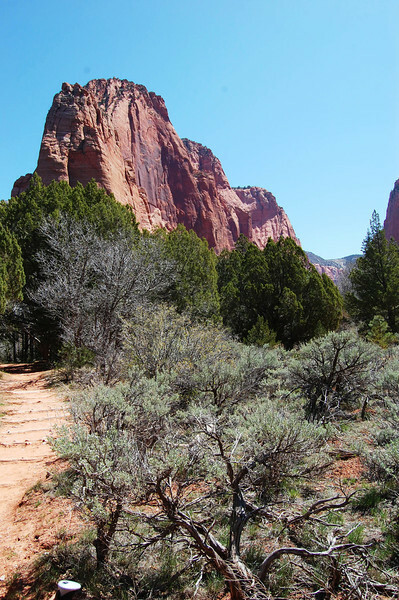 There were no roses to stop and smell, but I always do my share of taking time to stop and smell the sage, juniper, and pine. Love it. 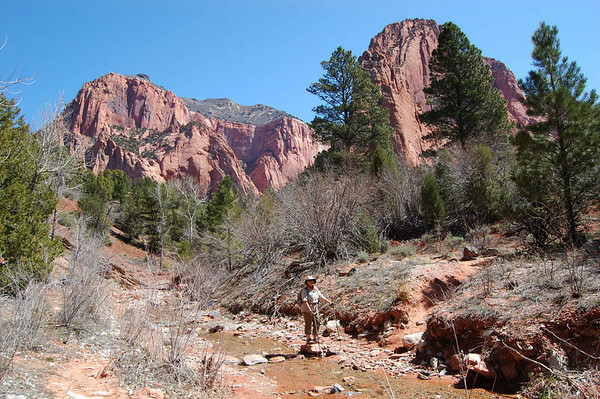 This hike has a gentle elevation gain of 500 feet in two and a half miles. There were some ups and downs on the creek banks, but overall it was just a gradual uphill climb. Eventually, the canyon walls started coming together. 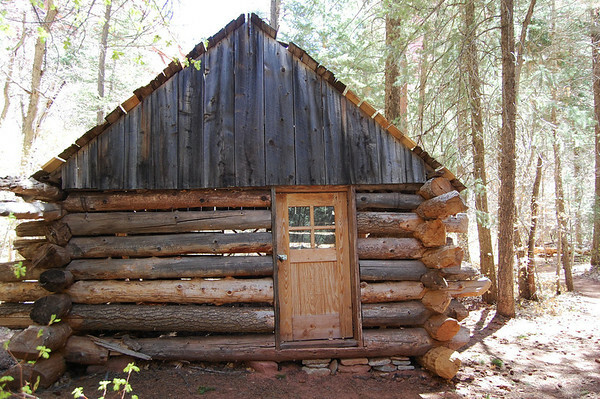 There were a couple of historic cabins (built in the 1930s) along the way. 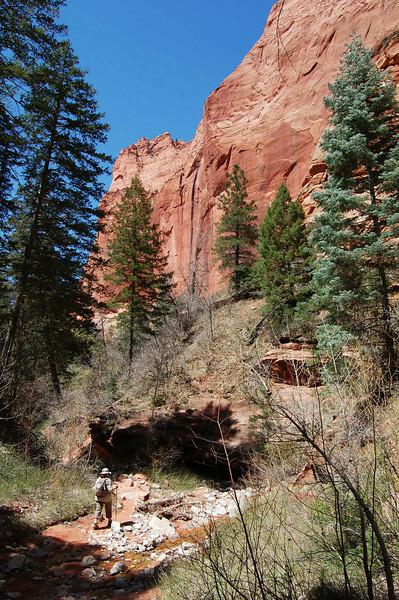 Here was one of the areas where we hiked in the creek bed. 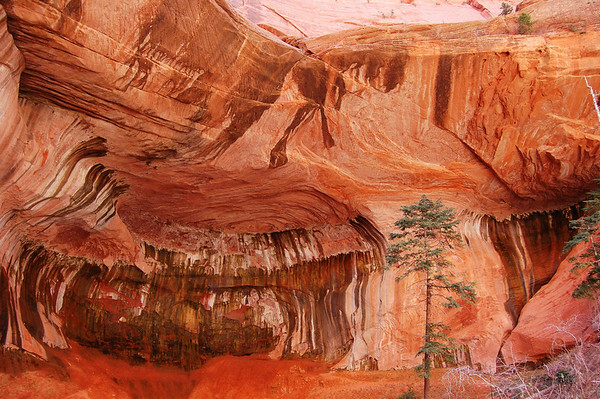 After a couple of hours, we arrived at the Double Arch Alcove. but others were already there and their voices echoed. It wasn't quite the peaceful experience we were hoping for, but we did manage to find a couple of rocks in the sun where we sprawled out and had a little lunch. I could have napped. We stayed for about a half hour before heading back. We encountered about 40 people in all today, but everyone was mostly spread out. We definitely had more alone, quiet time than yesterday. This was a great hike for us. A couple more shots looking back. What a beautiful day! 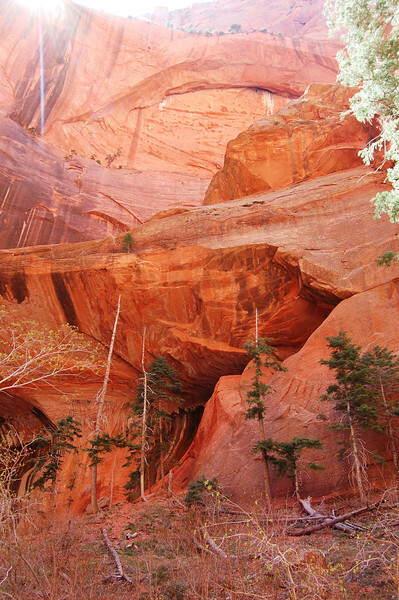 The hike, including all our pictures and our half-hour stop at the Double Arch Alcove, took four hours. When we were finished, we drove the last three miles of the scenic drive and took a few more photos. 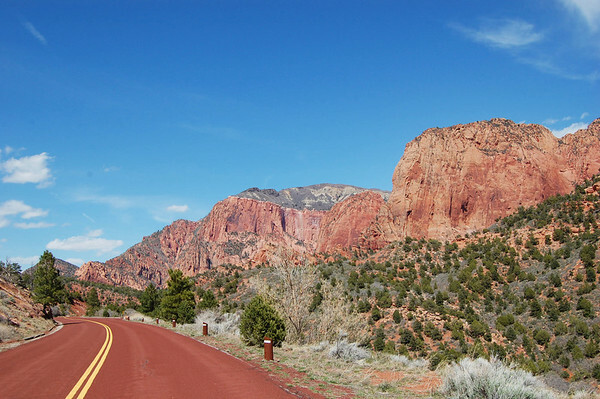 We'd really like to do the hike to Kolob Arch, one of the largest arches in the world, but it's a 14-mile round-trip and we're just not up for that. 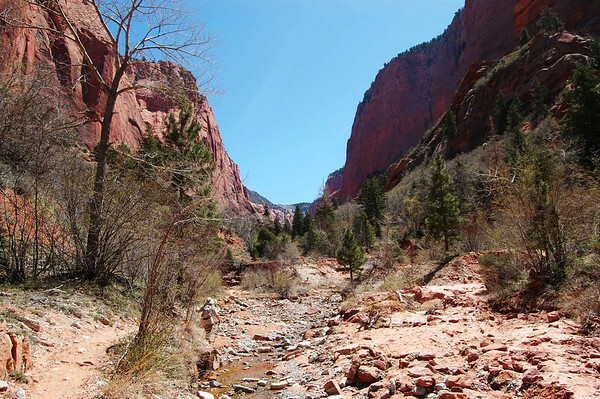 Certainly, this less-visited section of Zion is worth exploring.